Norway leads the world when it comes to EV incentives. That may be why sales of electric and plug-in hybrid cars have surged in the country recently. For one thing, cars with plugs are exempt from sales tax and VAT assessments. Norway has some of the highest sales taxes on new cars of any country in Europe, so that exemption goes a long way toward making electric cars price competitive with conventional vehicles. 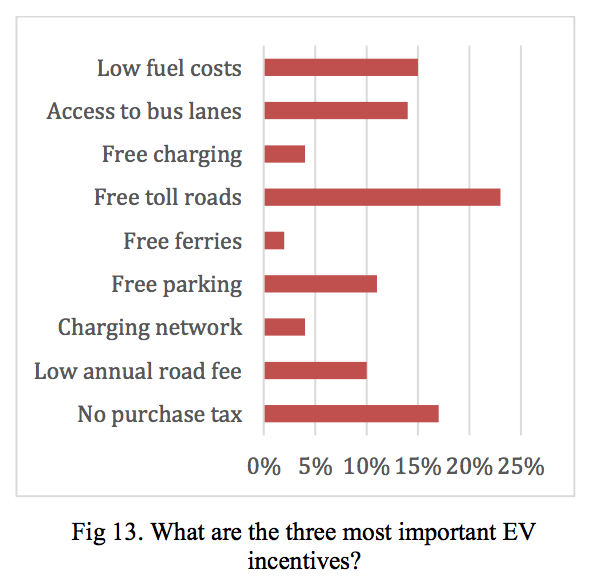 In addition, EV drivers benefit from a broad array of “soft” incentives. They pay no tolls on Norwegian highways, ferries, or bridges. They have unlimited access to all bus and commuter lanes. They are allowed to park free in most cities and are provided with preferential parking spaces. In some locations, they can charge for free, thanks in part to Norway having an abundance of hydroelectric power. This week, the Norwegian government has announced that some of those advantages may go away, as the country tries to re-balance its incentive package. EVs are becoming so numerous in some cities that there is no room left over for buses in the bus lanes! Moving forward, EVs could be subject to some local fees and taxes they were previously exempt from. Access to bus and commuter lanes might be restricted to avoid congestion. Free parking and charging may be eliminated in some areas. In others, preferential parking will be reserved for cars that have no emissions. That means plug-in hybrids will be excluded from that privilege. EV drivers could find themselves paying full tolls on the nation’s major highways and on ferries or reduced tolls on bridges and on the ring roads that surround most major cities. The good news is, the sales tax and VAT exemptions for electric cars will remain in full force and effect, at least until the end of 2017. Norway will have to decide at that time whether to renew the exemptions or modify them in light of policy considerations and economic factors. The exemptions cost the national treasury a lot of money every year. Government policies are always subject to change in light of experience. For the moment, Norway seems to feel it is the right time for a tap the brakes when it comes to some of its EV incentives. According to Norwegian website Side3, Norway will soon introduce new policies that require all new cars, buses and light commercial vehicles to be “zero emission” by 2025. Only two categories fulfill that requirement — battery electric and hydrogen fuel cell vehicles. The new policy states, “Until zero emission vehicles take over, petrol and diesel cars sold shall be rechargeable hybrids and, wherever possible, use biofuels.” (Note: translation by Google.) Thanks go to my Norwegian colleague, Leif Hansen, for alerting me to this story. Chart via “Norwegian electric car user experiences” study, conducted by Petter Haugneland and Hans Håvard Kvisle of the Norwegian Electric Vehicles Association.